Writing a novel? First, you’ll need one of these. 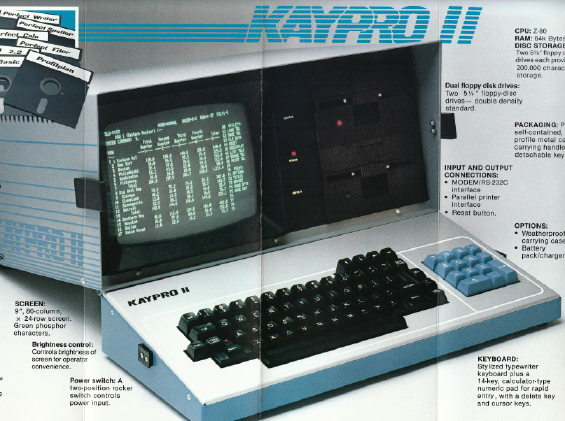 The Kaypro II. It comes with 64 KB of RAM and two double-sided, double-density drives for your 5 ¼ inch floppy disks. Encased in aluminum, and at just 29 pounds, it’s completely portable. Mine set me back about $1,800, but the price may have come down since 1983. Sure, you could go cheap and try to write your masterpiece on a typewriter, but that’s gonna take forever. 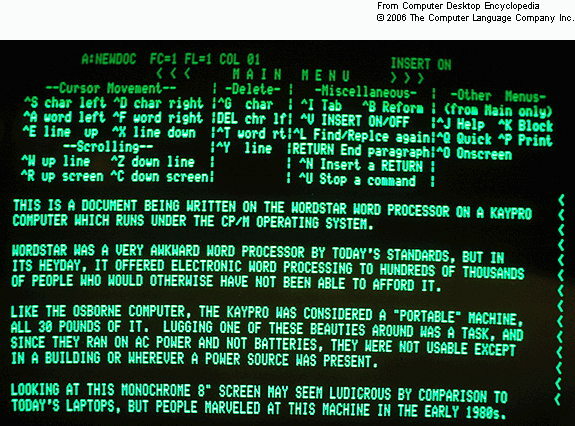 With the Kaypro, you can cut your novel-writing time to under three decades, tops. Sounds unbelievable, but I did it, and you can too. Here’s what makes the Kaypro such a time-saver. Let’s say you’ve written the following paragraph as a first draft. The first thing you’re going to want to cut is that line about violins being played under water. No one knows what that sounds like, with the possible exception of Lloyd Bridges. Who, sadly, is no longer with us. On your old Selectric, you’d have to retype the whole thing just to lose that one phrase. Not so with the Kaypro. Simply mark the beginning of the phrase with ^KB. Then hit ^F repeatedly until you come to the end of the phrase. Mark it with ^KK and then enter ^KY. Magically, the offending phrase disappears. Or you could move the phrase somewhere else with just another 13 keystrokes. Next you’ll want to change Slater’s name to Stryker, and then to Trager, and then to Stone, and then back to Slater. You’ll want to get rid of that part about “fulgent,” too. Also that whole section about “rap and discourse in the dark.” That’s a little weird. Take that out. Then put it back in. Then out. See how easy the Kaypro makes everything? Suddenly you have a zillion choices for every single line. Later you may realize that it’s not Slater who works in the photo lab, but some other character, and it’s not in the desert, but Northern Michigan. You may decide to cut the passage entirely. No worries. The Kaypro runs on the reliable CP/M operating system. However, depending on how much time has passed, your floppy disks will need to be converted to Apple’s operating system before you can make any changes to your novel, or work on it in any way, including simply reading it. And while computer science has not yet invented a way to convert CP/M to Apple, you can get some mail-order software from Ohio that will convert everything to MS/DOS, supposedly, if you can find an old Dell or something. Then you could convert that into Apple…or you could just retype the whole damn thing. If you still have that Selectric. Bonus bad advice: To get a Kaypro II of your own, build a time machine, travel to 1983 and bring one back "Duty Free." 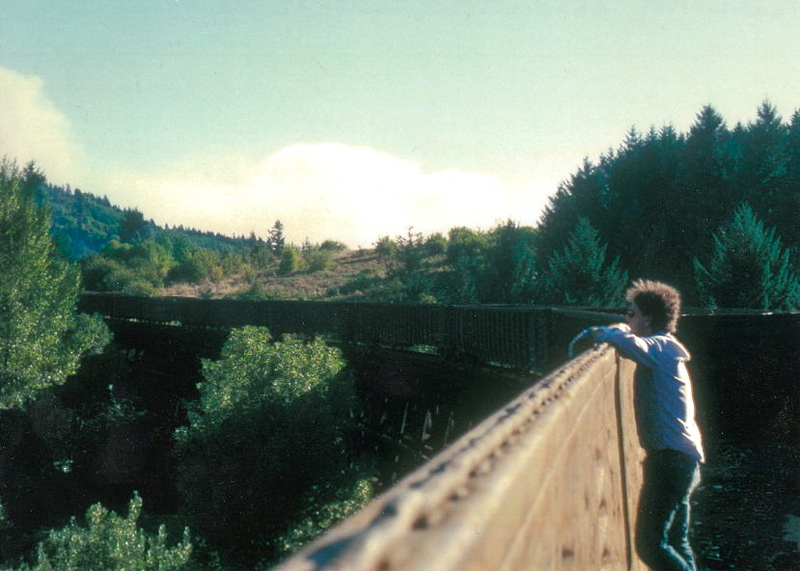 Thirteen years ago, I needed to take a break from working on my novel. It was 1997. The web existed, but barely -- there was no Google, no Facebook, no LOLCats. The Internet was empty, compared to today. To get my mind off Wire to Wire, I did what any born-in-Michigan, proud-of-the-Motor-City writer might do: I decided to start a website about Bob Seger. It wasn't meant to be a big deal. I figured I'd spend about six months on the site. Today, Segerfile.com turns thirteen years old. I was lucky in a couple of crucial ways. First of all, no one else was writing about Seger online at the time. I had a monopoly. I'd go to the public library here in Portland, search out old Seger articles on microfilm, copy them down, come home and post them on my site. That was the 1997 version of Google Alerts. Even luckier, though, was the fact that Seger was staying completely out of sight at the time. He wasn't touring. He wasn't releasing new material. Mostly, he was being a dad, raising his kids. The absence of real Seger news, which at first seemed frustrating, turned into a good thing. It forced me to become an essayist, rather than a reporter. The writing took on personality, became humorous, even sarcastic. The people who returned to the site came back, I think, not because there was news, but because it was fun to read. At least, that's how it seemed to me. The focus of this site, scottsparling.net, is Wire to Wire. But for one night only, join me as The Segerfile celebrates 13 years online by sampling a few of my favorite posts. And remember to do this. Harp jumps a freight in Wire to Wire and calls it his Crosscut hop. Call him Lucifer, if you think you should.